they attach to flesh easier. this does not start the bonding process. we recommend an obsidian knife. and press the gem–flower in. It lodges in a few minutes. as is a release of endorphins. Instruct the recipient to keep breathing. Do not forget about restraints. do not be alarmed by the opaque silver veins. avoid direct impact to the site for 60 days. for magical use after application. but is not, strictly speaking, disallowed. Bogi Takács is a Hungarian Jewish author, a psycholinguist, and a popular–science journalist. 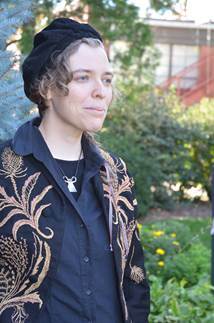 Bogi writes both speculative fiction and poetry, and eir works have been published in a variety of venues like Strange Horizons, Stone Telling, GigaNotoSaurus, and Jabberwocky, among others.